Your buffet is now open! 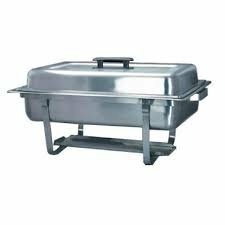 Chafing dishes are ideal when you need to keep food warm for extended periods of time, without needing electricity. The generous 8-quart size will be perfect for your next big party or catering event. Please note - **Chafing dishes must be returned clean and dry, and you will need to provide your own chafing fuel.